We offer pet portrait painting workshops once or twice a year for a month. 3 Sessions on Thursdays for 1 hour, between 2 – 6:00 PM. 4 Classes for $140.00 ( All the supplies will be provided). Send us a photo of your pet, we will sketch it for you on the canvas prior to your first session to enjoy your painting time! 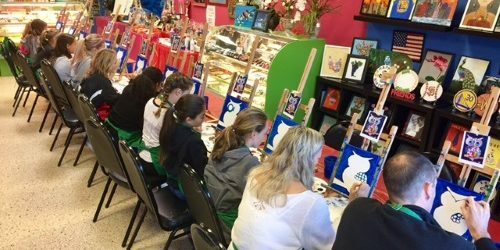 A step by step instruction will complete your session to paint on a 16×20″ canvas. We recommend ages 8 – adult, Private classes available at $55.00/ hr. Extra hours (after 4th session) available for your convenience at $25 – $35. /hr, depending on the size of the class. Custom to order pet portraits are also available in different canvas sizes.